It is a sad reality that in this day and age the world can be uncertain, volatile and dangerous place. CBRN (chemical, biological, radioactive, nuclear) threats are real, and as Emergency Physicians it is essential that we have at least a basic understanding and awareness. This post will primarily focus on chemical and biological agents. CBRN threats exist all around us. It is important to remind ourselves that is not just deliberate release of a CBRN agent that constitutes a threat, there are environmental factors that play an important role. The Ebola outbreak in west Africa represents a biological threat, the reactor explosions at Chernobyl and Fukishima represent nuclear and radiation threats, and the Bhopal disaster represents a chemical threat. In addition to these we have the ever present threat of terrorism; we really ought to be switched on to CBRN. If you work in an ED, your department and local ambulance service should be aware of any chemical plants/factories in the surrounding area and be aware of the chemicals involved. Similarly an awareness of the characteristics of the population close to your department should be understood, especially in the context of epidemics around the globe. The Ebola/MERS/SARS epidemics have been good examples of biological threats, and we as Emergency Departments may be the first port of call, and as such have had a low threshold for isolation and investigation in ‘high risk’ patients. There may also be more insidious presentations. If there was a huge chemical plant explosion there is a good chance the ED would know about it. However if there was a deliberate release of a CBRN agent there may not such awareness. Be vigilant for clusters of patients presenting with odd or virtually identical symptoms in short succession. Don’t become paranoid, but do become aware. How does a department react? In the event of both accidental and deliberate release of a CBRN agent, there is a modified approach to triage. This approach is centred around the basics of EM; ABC evaluation. Casualties are divided into groups depending on the physical/physiological abnormalities detected. The most severely affected, who are still alive, require immediate treatment, those who are affected but not in a life-threatening state require urgent attention, and those with no apparent features can have a delayed assessment. Triage is dynamic and patients can change category. A whole series of posts can be written about triage in mass-casualty/CBRN events, and I probably couldn’t do it justice! So let’s think about the subject of deliberate release of CBRN and what kind of agents are used and what effects they may have. A general approach to chemical agents is using the CRESS (Consciousness, Respiration, Eyes, Secretions, Skin) mnemonic. Using simple mnemonic such as this allows us to rapidly assess a patient and gain vital clues as to what the toxidrome is. These agents are typically organophosphates and work by blocking acetylcholinesterase. There are two series of nerve agents; G-series and V-series. The G series were discovered by a German scientist named Gerhard Schrader. Schrader was a scientist attempting to create effective insecticides in the battle against world hunger, however inadvertantly discovered tabun (GA) and sarin (GB). Later on came soman (GD) and cyclosarin (GF). 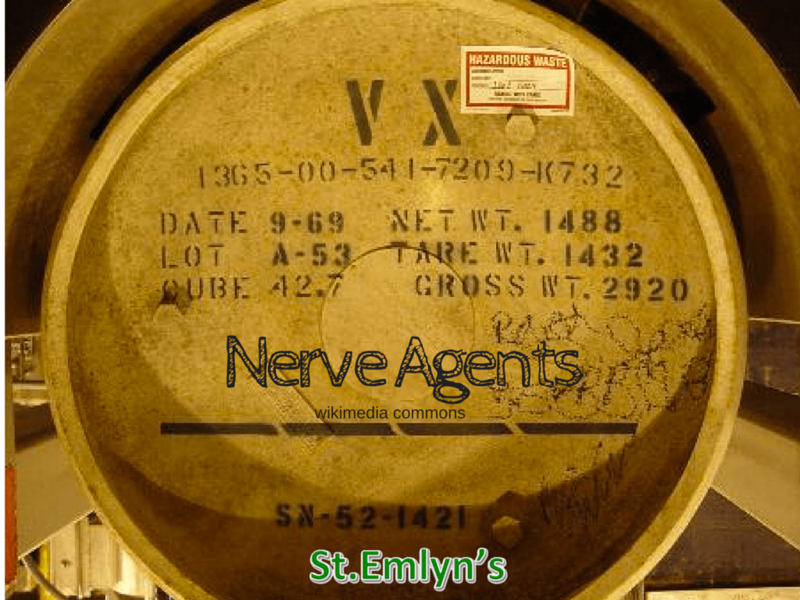 The V-series of nerve agents were also discovered in the pursuit of an effective insecticide. The most famous (or infamous) agent being VX. G-series and V-series nerve agents differ in their persistence. The G-series agents are not persistent, whereas V-series agents are, meaning they stick around for a while. Diarrhoea, Urination, Miosis, Bradycardia, Bronchospasm, Emesis, Lacrimation, Lethargy, Salivation, Seizures. Pyridostigmine is a reversible partial cholinesterase inhibitor. It is given in the military as ‘Nerve Agent Pretreatment Set (NAPS). The idea being that should an individual become exposed to a nerve agent there are fewer sites of action for it work upon due to them already being (reversibly) blocked. Post-exposure to a nerve agent the individual then stops taking the NAPS. As it is reversible it unbinds/doesn’t bind further to acetylcholinesterase, meaning there is some enzyme avaliable to mitigate the effects of the nerve agent. Organophosphates cause irreversible blockage of acetylcholinesterase, staginess cause reversible blockage. Cyanide exposure can be caused by an intentional release, but also it should be considered in patients who have been victims of house fires as it is often released by the burning of furniture. Cyanide is potent and deadly, and deaths can occur in minutes. It works by inducing cellular asphyxiation, mainly by blocking the action of cytochtome C oxidase (an enzyme involved in the electron transport chain). Cyanide is the infamous chemical used (as Zyklon B) to commit the atrocities in the concentration camps of WW2. 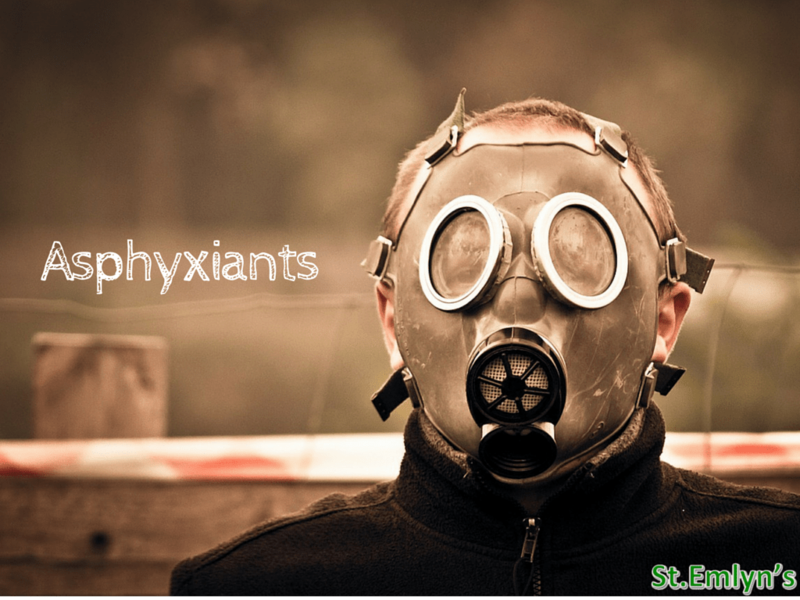 Patients exposed to cyanide will have have high oxygen saturations on pulse oximetry and also on venous blood gas. Lactate will be markedly elevated and methaemaglobin will be low. Cyanide binds with affinity to ferric iron over ferrous iron. However it binds with even greater affinity to cobalt. This is rationale in our approach to treatment. The quickest method of treating cyanide poisoining is using dicobalt edetate, however this in itself is toxic and should only be used in confirmed or severe cases of cyanide poisoning. Nitrites can be considered as a treatment option. They work by converting the ferrous iron in haemaglobin to ferric iron, causing the production of methaemaglobin. As cyanide as a higher affinity for ferric iron, it will bind preferentially to methaemaglobin over haemaglobin. This however is also not without side effects, as the resulting methaemaglobin will accumulate, turning the cyanide poisoned patient into a nitrite poisoned patient, the treatment for which is methylene blue. The safest way to treat cyanide poisoning is with hydroxocobalamin (Cyanokit). Hydroxocobalamin contains a cobalt ion, which cyanide has the greatest affinity for. Cyanide will bind to hydroxocobalamin, thus forming cyanocobalamin, which is a harmless molecule excreted in the urine. Vesicants are agents that causing blistering. The most famous of these agents are sulphur mustard and lewisite. Sulphur mustand is an alkylating agent that has mutagenic and carcinogenic properties. It very fat soluble, allowing to pass through skin with ease. 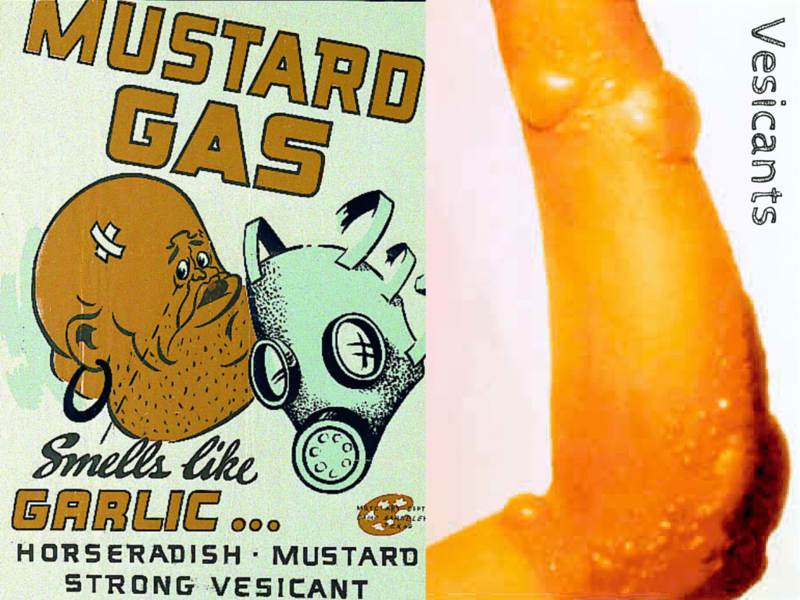 For the first 24 hours there may be intense itching and irritation, however by 24 hours large blisters will appear filled with yellow fluid at the sites where mustard contacted the skin. It can be neutralised with household bleach, however the long term management will be the same as any conventional thermal burn. Lewisite also causes severe chemical burns, however with sufficient exposure can cause liver necrosis and arsenic toxicity. Arsenic toxicity causes multi-organ failure due to it inhibiting pyruvate dehydrogenase and thus affects ATP synthesis. If there are features of aresenic toxicity, dimercaprol can be considered, otherwise treatment revolves the management of the burns. If inhaled, consider treating the patient as you would a patient with ARDS; low tidal volumes and even consider ECMO if severe enough. Chlorine and phosgene are the most noticeable agents in this group. They can cause severe bronchospasm and pulmonary inflammation. 85% of the deaths due to chemical weapons in WWI are attributed to phosgene. Chlorine causes intense burning to the mucosa it comes into contact with. In the lungs a chemical reaction most likely occurs whereby the chlorine mixes with water to form hydrochloric acid, which then destroys the respiratory tissues. Phosgene creates a picture not dissimilar to ARDS, whereas chlorine can cause non-cardiogenic pulmonary oedema. These agents can be almost any organism that cause serious medical complications. The most famous agents used in deliberate poisonings, and good examples, are perhaps anthrax and ricin. Bacillus anthracis was famously used in the US Postal attacks is a rod shaped Gram-positive bacteria. Its effects are dependent on the mode of exposure. It can present as a cutaneous disease, characterised by an eschar, and is rarely fatal. Gastrointestinal anthrax, typically caused by ingestion of infected meat, causes haematemesis and severe diarrhoea. Pulmonary anthrax is caused by inhalation of anthrax spores and initially causes cold and flu like symptoms before the patient succumbs to pneumonia and ultimately respiratory collapse. 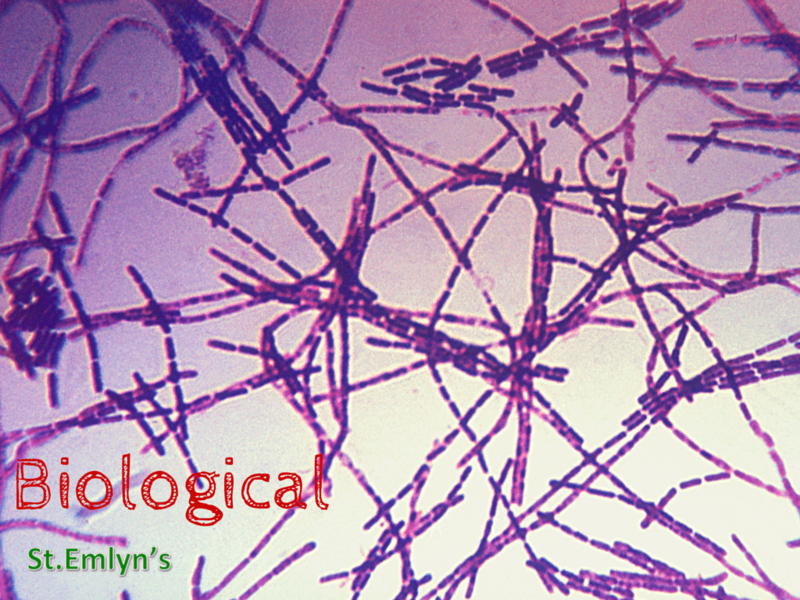 The key to survival in anthrax poisoning is early antibiotics, with ciprofloxacin, doxycycline and penicillin. Ricin is developed from castor bean seeds and is highly toxic. A well known case of deliberate poisoning is that of Georgi Markov who was assassinated via a pellet fired from a modified umbrella whilst walking through London. Ricin poisoning can be fatal and no licensed antidote exists (currently), however with good supportive care patients can make a good recovery. Biological weapons/deliberate poisonings require an approach that one would make with any patient with a significant burden from sepsis and any other medical condition. -Alpha: Slow to move, don’t move far and don’t penetrate the outer layers of skin. They cause their damage if ingested/inhaled. Polonium, implicated in the death of Alexander Litvinenko is an alpha emitter. -Beta: These are electrons that can penetrate the skin and also cause damage when ingested. -Gamma: High energy, travels long distances and difficult to shield against. -Neutrons: These are emitted from nuclear fission and are highly penetrating and extremely damaging to tissues. Ionising radiation interacts with DNA and causes damage through this mechanism. Radiation exposure is measured in Sieverts, a unit of energy. To put all of this into context, one chest x-ray is a dose of less than 20μSv. Each year we are exposed to 1-2mSv from background radiation. The dose at which acute radiation syndrome occurs is at 0.5Sv, or 50,000 chest x-rays. At doses greater than 2Sv radiation will cause death. As radiation affects DNA, it’s greatest impact is on tissues with high cellular turnover, i.e. GI tract and bone marrow. Vomiting, diarrhoea, coagulopathy and immune suppression all ensue. In addition to radiation exposure, a nuclear device causes injuries and fatalities through thermal burns, and the energy releases from the blast. 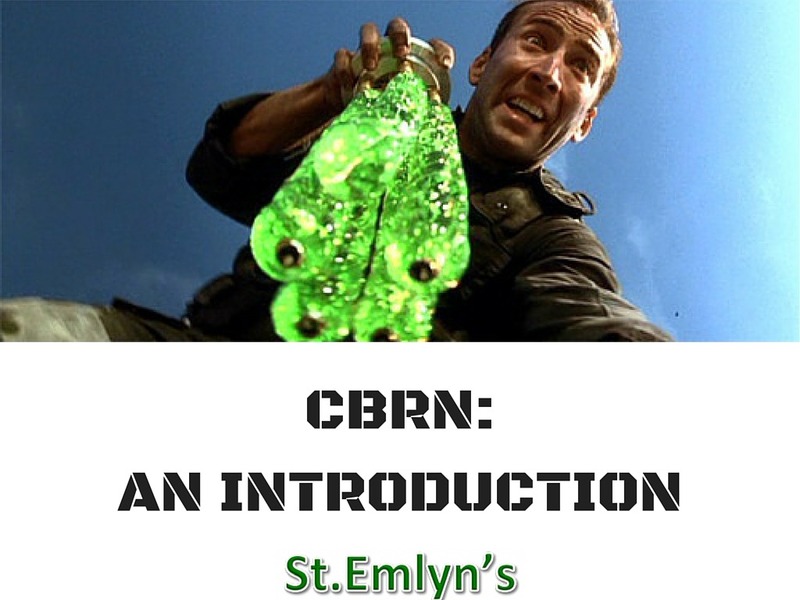 CBRN unfortunately exists as a threat, both through accidental and deliberate release. I hope never to have to treat a patient affected by any of the agents I have discussed. As emergency physicians we should at least be aware of some of these threats and be able to give our patients the best care should the worst ever happen. I do not profess expertise but I write this out of personal interest in the subject and hope others find the topic interesting enough to read further around the subject. At the end of this blog you should not feel confident in managing these patients, you should hopefully feel interested and empowered enough to learn more. What we all need to do is to stop and think about what we know, what we don’t know and where we can get help from should a CBRN incident take place. Don’t forget your poison centres. They are fantastic sources of advice for toxins and hazards. Your local HART team (UK) will also have specialist knowledge (and kit). A look at decontamination from Cibulsky et al. 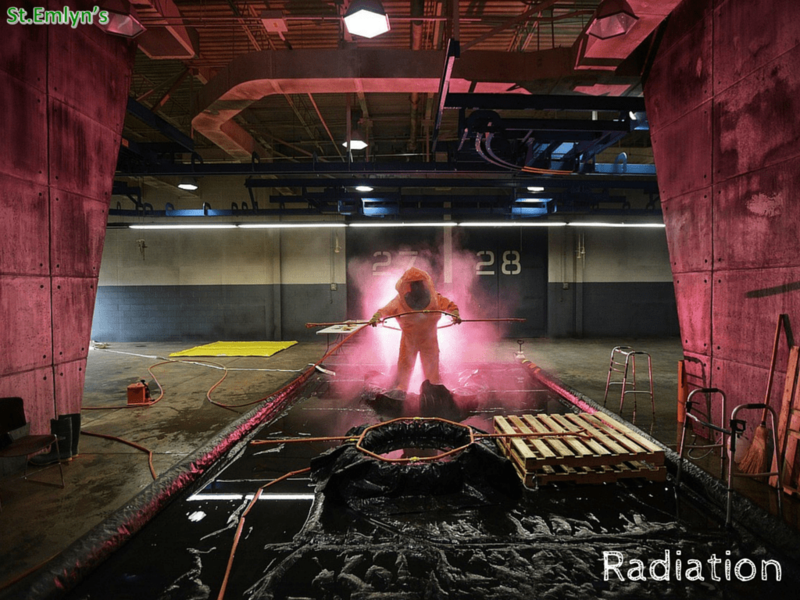 Mass Casualty Decontamination in a Chemical or Radiological/Nuclear Incident with External Contamination: Guiding Principles and Research Needs. RAMC open access articles on Biological agents. RAMC open access articles on Chemical agents. Auto injectors are nation specific with atropine / obidoxime an alternative to the triple mentioned. Always check your local cache. Toxbase has a updated, free, app for iOS and Android, with offline access to the full repo of advice for those with an NHS.net email address. Also, the NARU site has useful info for the ‘Initial Operational Response’ which may be of interest to ED clinicians. Finally, active shooter and MTFA awareness is really hot on the agenda as part of the ‘E’ for expo/pyro spectrum of threats, which whilst more pre-hospital/EPRR related, is where the ED will need to hold the fort for the patients to be expected from such an incident. Forewarned is forearmed!